Aquilegia vulgaris (Ranunculaceae) (Columbine) is a flowering herbaceous perennial native to Europe and widely cultivated in UK gardens. It is an important crop for some commercial nurseries that produce large numbers of potted plants for retail sale in garden centres. In 2008, 100% crop loss due to a bacterial disease was reported by one grower. 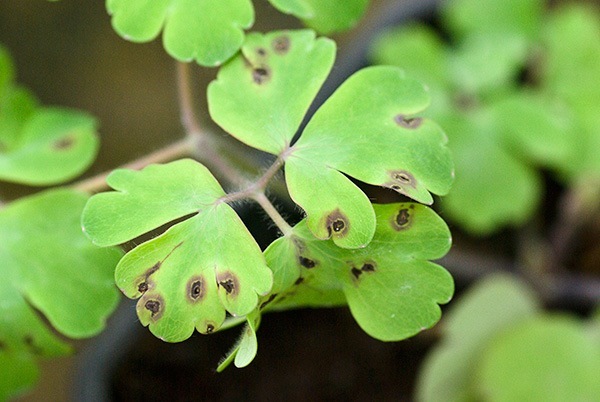 Subsequently, during a survey of bacterial diseases of herbaceous perennials on commercial nurseries carried out during 2010 (Roberts, 2011), symptoms consisting of black spots or larger lesions with a water-soaked margin were observed on the leaves and stems of plants at two nurseries in different regions of the UK (Fig. 1). Microscopic observation of lesions comminuted in drops of sterile nutrient broth on a sterile microscope slide, revealed the presence of large numbers of bacteria streaming from the cut edges. Suspensions were streaked on plates of Pseudomonas Agar F (PAF, Difco) and 5% sucrose nutrient agar (SNA). Plates were incubated at 25°C for two to three days and resulted in pure cultures of a blue or weak-blue fluorescent (on PAF), non-levan (on SNA) Gram-negative bacterium. Isolates were characterised on the basis of the LOPAT tests (Lelliot & Stead, 1978) as P. syringae Group 1b (L-O-P-A-T+) and were also aesculin positive, gelatinase negative, and L-tartrate utilisation negative. Young leaves of A. vulgaris, growing in 7 cm pots, were inoculated by stabbing several times with a sterile insect pin charged with growth from 48 h cultures growing on PAF. Following inoculation, plants were enclosed in polythene bags for 48 h to maintain high humidity and grown on in a glasshouse with minimum set temperatures of 18/15°C (day/night). Control plants were stabbed with a sterile insect pin. Symptoms typical of those observed on the nurseries began to appear after five to seven days on inoculated leaves (Fig. 2), and were absent on control plants. Re-isolations on PAF yielded pure cultures of bacteria with characteristics identical to those of the inoculated isolates. Sequencing of the rpoD gene from two isolates (9064, 9082; GenBank Accession Nos. KF924196 and KF924195) indicated 98% identity to many strains of Pseudomonas syringae and placed them in Phylogroup 1 (Parkinson et al., 2010). This group also includes P. s. pv. delphinii, which is also a Group 1b (i.e. non-levan producing) P. syringae, with a host species also in the Ranunculaceae. Preliminary results indicate that pv. delphinii is not pathogenic on aquilegia and isolates from aquilegia are not pathogenic on delphiniums. Aquilegia isolates are also non-pathogenic on lilac (Syringa vulgaris). This is the first report of a bacterial leaf spot of aquilegia caused by a strain of P. syringae, and preliminary evidence indicates that this may be a distinct pathovar. 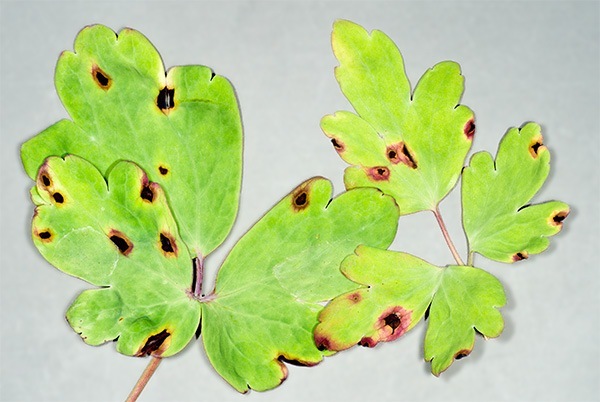 Figure 1: Aquilegia leaves with typical symptoms bacterial leaf spot caused by Pseudomonas syringae. Figure 2: Typical symptoms of bacterial leaf spot developing on inoculated aquilegia leaflets, seven days after inoculation with isolate 9064. Lelliott RA, Stead DE, 1988. Methods for the Diagnosis of Bacterial Diseases of Plants. Oxford, UK: Blackwell Scientific.